'Balloon', Sorcha O'Brien and Eli Caamano, commissioned by the National Sculpture Factory, Cork. Photo by Cian O'Callaghan. One of the impacts of the financial crisis that began in late 2008 is that the strategies, plans, and visions underpinning the development of cities do not speak to current realities. Many of these strategies project twenty or thirty years into the future, a future they seek to build from a present that no longer exists. 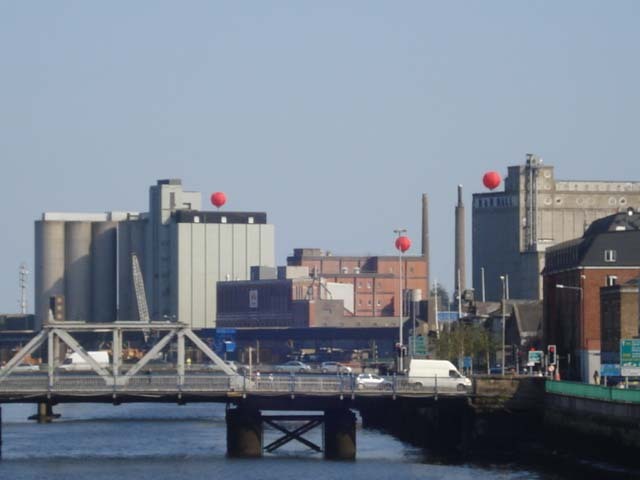 The art installation depicted in the photograph above, which was produced in Cork city, Ireland during September 2008, captures the mood of this period very well. It caught the city at a pivotal moment when the aspirations of the Cork Docklands Development Strategy – a plan initiated around the start of the millennium, which came to fruition in unison with the collapse of the property market – were about to be swallowed up the recession. At the time these industrial buildings were slated for demolition to make way for three million sq ft of offices and over 1,200 apartments. The installation was, in a way, like an elegy for these buildings and the version of industrial Cork they represented. Due to the property crash, the intended development never happened, and these industrial buildings are still sitting on the quays. The Celtic Tiger period in Ireland was characterised by optimism and growth. But Ireland is now characterised by a very different narrative; that of banking collapse, sovereign debt, failed speculation, and ghost estates. This confrontation between the exuberance of the Celtic Tiger and the miasma of the current period is expressed in those strategies that bridge the rupture between these two very different eras. Now, rather than the population growth that was anticipated as a result of the Docklands project, Cork has to contend with halted developments and vacant properties, the loans of which are owned by Ireland’s ‘toxic’ bank, the National Asset Management Agency (NAMA). One of the city’s landmark buildings, the Elysian, for example, is now also one of Ireland’s most iconic ghost estates with reputably only twenty five units in the complex sold. Meanwhile, the local Occupy Cork movement recently moved their camp off the streets and into another NAMA owned building in the city centre. The dilemma currently faced by Cork is not unique to that city. This conundrum raises a number of important questions for urban geographers. One, which I address in my paper, is what happens to all those powerful urban visions underpinning aborted growth plans? As we enter into a new era of capitalism, a key research question for urban geographers will not only be to address how to move the development of cities forward, but also to understand the latent affects of the plans and visions now lost but not forgotten. The author: Dr Cian O’ Callaghan is Postdoctoral Fellow at the Department of Geography and NIRSA (National Institute for Regional and Spatial Analysis), National University of Ireland, Maynooth. This entry was posted in Area and tagged Art, Cultural Geography, Economic Geography, financial crisis, gentrification, Global Issues, Ireland, Political Geography, property market, red balloons, regeneration, Social Geography, Urban Geography, Urban planning on January 23, 2012 by RGS-IBG Managing Editor: Academic Publications.